LuxBind Portfolios are the newest way to present your best work. Faster assembly than ring-binders. No need for sleeved inserts and easy page turning just like perfect bound books. Straight from the printer, you insert paper stacks with the clear cover under the LuxBind bar and hand-tighten. Then head to your meeting! Maintain the sophistication your brand requires with natural bamboo and finished aluminum. Custom laser engraved logos and signatures available in both the metal bar or clear mylar cover with quick 7-day turnaround. Sustainable materials. Made in Portland, Oregon. Built to last. 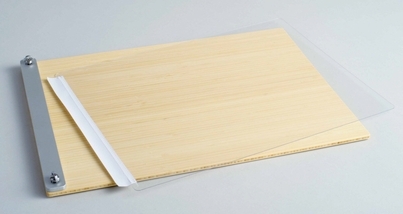 Natural bamboo backing board with aluminum clamp. Finished size: 12.5" x 17.25"
Firmly holds between 5 to 75 pages of 20 lb. text stock. Clear, thick Mylar cover included. One set of threaded D-ring bolt and fixed screw post are included and made of stainless steel. 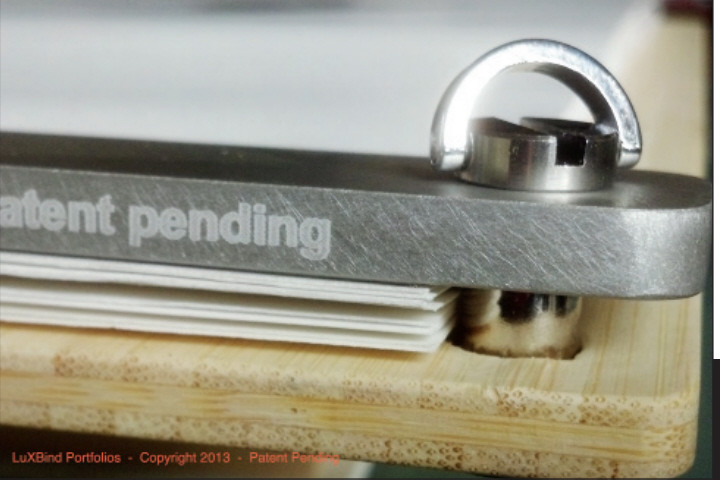 D-ring folds flat against the clamp when not in use.